August 22, 2011 by Alphageek in "81 proof", "alphageek", "bourbon", "wild turkey"
Well, not much has been happening over here on Alphageek's Thoughts. The lack of activity does not mean that I don't have any thoughts, but those thoughts have been over on Alphageek Talks Food. I decided to take a little trip over to the store and pick up some new inspiration, to share some inspiration on this proud but neglected site. The inspiration was readily available at one of my favorite package stores, Green's. I was going to start this article by raving about Green's, and what a cool place store it is. However, events have occurred to intercept those thoughts, and replace them with a little rant that I hope you enjoy. Don't worry, I will rant on about Green's at some other point. We enter the store, and I notice there is a bottle of Wild Turkey that is somewhat different than the others. Take a look at the picture yourself if you do not believe me. The bottle very clearly says 81, instead of the usual 80 I expected to find. At first, I thought the bottle might be a tribute to Interstate 81, but I then realized that thought was wishful thinking. I decided to take a chance, and purchased the interesting bottle. I arrived at home, and did what any good geek would do with a new bottle of bourbon: I googled it to find out what the story behind the new proof was. I know 81 does not seem very different from the usual 80, but the geek in me knew something was different, and that difference of 1 was trying to tell me something. 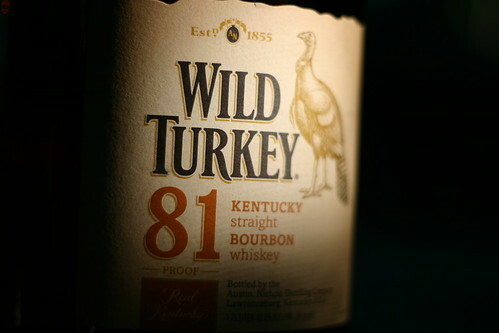 The search results first allowed me to find out that this is indeed a new blend from Wild Turkey. The new blend was designed to be more "mixable" in today's drinks. Okay, so that was interesting. What really gets me going in a bad sort of way is reading the press release. Fine, the makers have a press release. So I search around to see what others think of the new bourbon. All I could find were people reposting the darn press release. Real sites, where people make money! I am supposed to trust pinheads that present press releases as "work" and get paid for it? Talk about getting paid to do nothing. I make only one promise here: I write this stuff. Good or bad, you are reading my thoughts, and not regurgitated text from some other site. So, what are my thoughts on this bourbon? It is a different kind of drink. It is very flavorful, yet somehow the taste is more easily dispersed in a drink. After I added a little ice, I definitely noticed that the bourbon was a little weak for my tastes. Yet somehow, the bourbon was great with just a touch of ice, or even just neat in a rocks glass. The flavors are somehow still fully there, yet more subtle. I find it to be a very enjoyable drink, that is worth checking out, or inviting yourself over to try. "81 proof", "alphageek", "bourbon", "wild turkey"